Shadows are the in thing these days, and Hudson Soft is following along with the trend with its new platformer for the Wii. Hudson Soft announced a new platformer for the Wii this week called A Shadow's Tale. 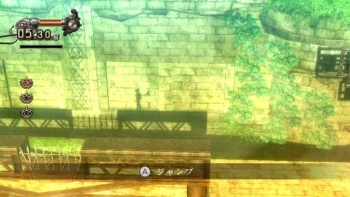 True to the name, players take on the role of a shadow, and in a twist can only run and jump along shadows projected by the environment. The game's first trailer unfortunately doesn't show any gameplay, but it does give me a bit of an Ico feel, which must mean that A Shadow's Tale will be as good as Ico or better. I'm kidding, and only so hopeful because I can't wait a single moment longer for Team Ico's upcoming The Last Guardian, but the game looks interesting nonetheless and could be worth a look. As the trailer shows, an imprisoned boy has his shadow severed by some kind of ancient Cylon and must traverse a tower in this shadow form. According to Hudson, the boy will disappear if engulfed by either too much shadow or too much light as he attempts to collect key items. The angles and positioning of light sources, and how they change, appear to be key factors in the layout of each level. Similar to Ico the boy will have to contend with shadowy foes and solve puzzles. The following screenshot gives a better idea of how the game will look and play. The main character's winged helper sylph called a "Spangle" is important to the puzzle solving and seeks to make A Shadow's Tale more than Super Mario Bros. in the dark. The Spangle can manipulate physical items, like levers and cranks, which should extend bridges and such to help the boy continue on his journey. A Shadow's Tale could be just a simple platformer, but the visual style and puzzle elements are appealing to me. Along with Shadow Physics, it looks like shadows are becoming a popular trend in game design.